Big Shock Racing is catching up. Macik is happily reaching the top. The result of the fifth shortened part of the race is without a doubt a success for Martin Macik and his team. 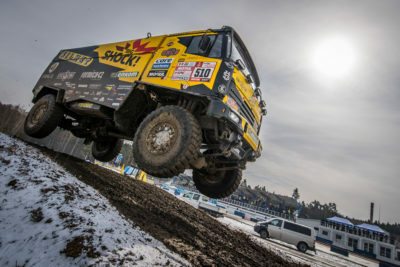 Fourth place with only 16 minute difference from the first De Rooye gave the team needed confidence, which is also intensified by raising onto the 16th place. 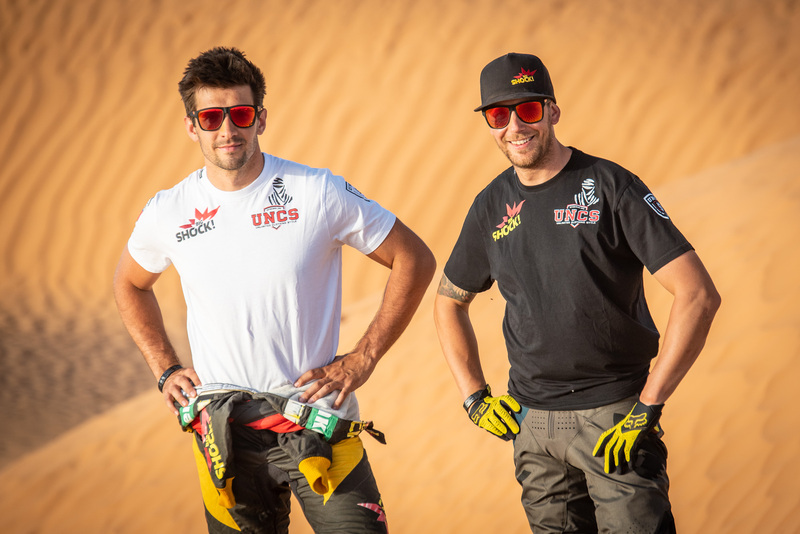 „Very well handled check point, which wasted time of many crews, good navigation work, that is what moved us forward,“ evaluates fifth day at Dakar Martin Macik. 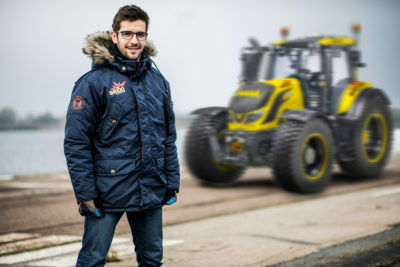 „Even as we were going down from the mountains we overtook maybe seven trucks and we continued in our aggressive drive even on a flat dusty stretch, where everyone was giving it 100%,“ says pilot of black-and-yellow Liaz and adds that that was the best result in his entire racing career. The organizers had to shorten the fifth part of the race due to flooding, and bad atmospheric conditions. Instead of planned 438 measured kilometres, crews had to drive only half (219 kilometres). 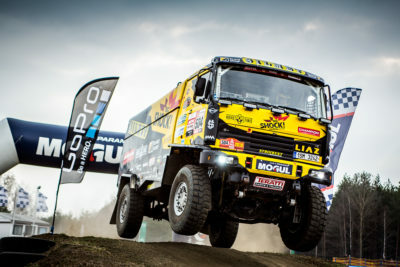 Starting from 25th place wasn´t ideal for the truck with a number 518. But due to strong rain, the dust came down and Martin Macik could drive faster in narrow mountain pathways. 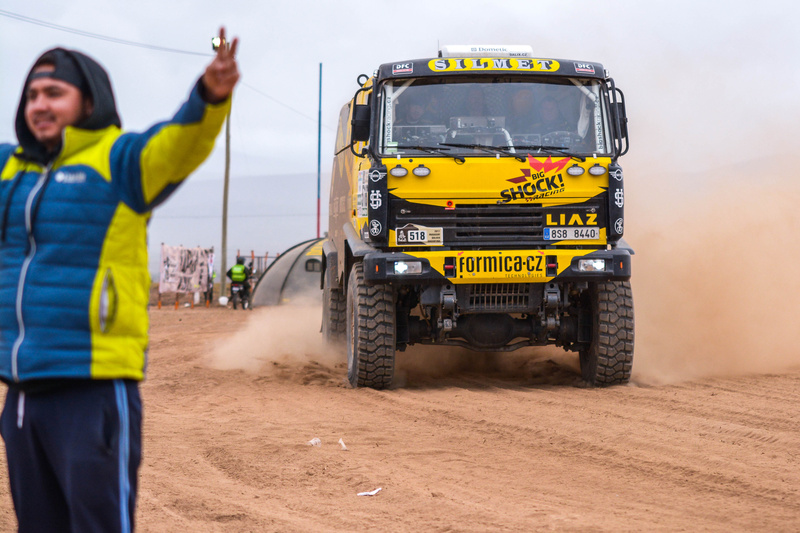 After getting to Gran Pampu Salada Big Shock Racing truck was fighting for its place amongst top 15. „We managed to skilfully avoid one collision, there was one truck that was stuck and other 5 around it, so we quickly drove through the check point and worked systematically on moving forward,“ says Martin Macik. Even the rest of the group is in great shape. High altitude didn´t do anything to them. Adrenaline is working its magic. Fifth part from Tupizy to Orura was supposed to be mainly on plateau. Hard and quick terrain. Weather changed everything. Pampas are often flooded with water and it wasn´t different now. For racers the race wasn´t finished in half. They had to fight the bad weather even in bivouac. “We don´t sleep much. We repair or do revisions – breaks, undercarriage, welding of aluminium tank which was repaired on the track or changing a pump. We are tired, but still in a good mood. We let them put a stamp in our passports to show that we have been to Bolivia and assured customs officers that we are not smuggling anything. They didn´t laugh but after a while I found out why. Most people were constantly chewing cocaine and were tweaked. Road is only few kilometres long, the rest is dust. I should start chewing too…,” says Lavor.